Place des Arts in downtown Montreal, Quebec is full of artistic decor, a prime example being the golf water fountain outside the entrance. Laid out as a golf course fairway with its green hues, a golf cart has found itself stuck in the watering hole. People love to relax near this fountain while enjoying the sunshine and listening to the water trickle around them outside Place des-Arts. Golf water feature outside Place des-Arts in downtown Montreal, Quebec, Canada. 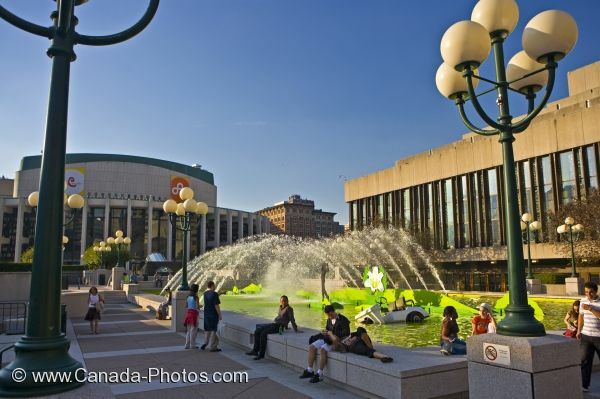 Picture of the water fountain and golf cart display outside Place des-Arts in downtown Montreal in Quebec, Canada.